Jack is cold - no wood for his fire. Takes axe and goes to look for a tree. Sees tree - smiles "I'm stronger than you". Swings axe - but slips on ice - bangs head. "Ice, you're strong - but sun is stronger - when he comes, you go away." "Sun, you're strong - but cloud stronger." "Mountain - tree is stronger (tree can grow on mountain but mountain can't grow on tree!)" "Tree - I'm stronger - got my axe!" I heard this tale as Jack Turnip from UK teller, Hugh Lupton. It is now one of my favourites as a participation story with young learners and is the title story on the teaching video The Strongest of Them All. 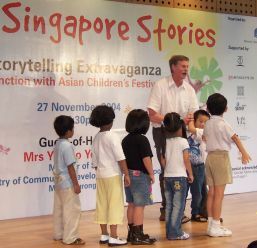 Telling the story in Singapore.